Fall semester has kicked in! Your desk is piled high with to-do lists and notes, Inbox Zero is just a nice dream you once had, and your calendar is bulging with meetings. Meetings! They’re a huge part of the workday – and of the experience of being an employee. Meetings are part of your everyday UX. They are created on purpose, and like most anything else, they can be redesigned to provide better UX and to be a more effective tool. Never thought of it that way? 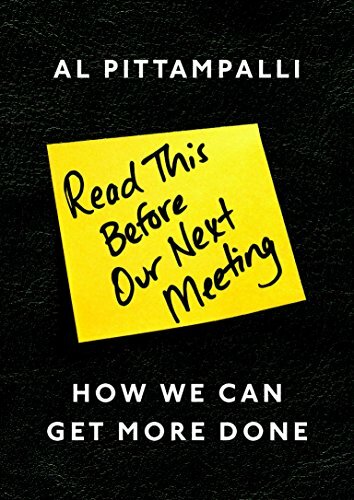 You’ll want to join DÜX BÜX, our monthly UX book club, for the next book on our reading list: “Read This Before Our Next Meeting” by Al Pittampalli. Some of us have had this book on our reading lists and/or on our Kindles for a while now, and we thought this fall would be a nice time to dive into it. It’s only 80 pages in hardcover, so each month’s “assignment” shouldn’t be too onerous – and, as always, you’re welcome to attend the meetings even if you haven’t done the reading. We are a judgement-free book club! The book is available on Amazon in both print and Kindle formats (as well as on Audible or audio CD if you are so inclined), and the Business/SPEA IC has a copy in IUCAT with a second copy on order. Feel free to read either the first or second edition, whichever is easier for you to get your hands on; it looks like the changes are relatively minor. All IU librarians & library staff are welcome to join us! Read more about the genesis of DÜX BÜX (and why the umlaut?) and about our spring semester readings.